Please be sure to read Part 1 and Part 2, if you’re new to this series of articles. All aircraft contain a piece of avionics technology called a transponder. This contains a receiver, and a transmitter. When the signal from ground radar is received, the transponder transmits a short burst on 1090 MHz, encoded with information. Mode S, also called the Extended Squitter, is the one we’re interested in. There’s an online document called ADS-B for Dummies that goes through the various messages, and their format. Since the RTL dongles can receive 1090 MHz at a wide bandwidth, it turns out to be possible to use them as low cost transponder decoders. Very low cost. You can pick them up for around $15 on eBay. Dedicated ADS-B receiver packages are more. Much more. As in hundreds of dollars. 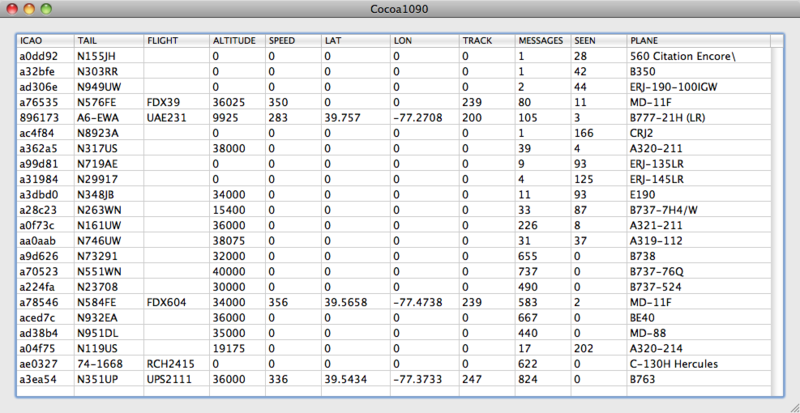 Cocoa1090 uses the ICAO hex code to derive the tail number (and aircraft model) from a database in a text file, which are also displayed. This entry was posted in Electronics, Receivers, SDR, VHF/UHF by Chris Smolinski. Bookmark the permalink. Your links to Parts 1 and 2 of the article dump me back here! So no Parts 1 and 2. I’m OK with Part 3 because I’ve got this far using other links, but other readers may well want the two previous parts. Fixed, thanks for pointing that out. The site domain name changed, and that has messed up some of the links. The “ADS-B for Dummies” link is also broken. I think if you look at it you’ll see the problem, though as I adjust by removing your domain that was prepended, the original URL just times out. Thanks, Mike, I think the link is fixed now. I notice the majority of A/C picked up report 0,0 lat/long. I’m having the same issue…is this because too few aircraft are using the 1090 ES position reporting ADS-B mode or because I’m too far from a ground station to receive the combined signal? I find that not many aircraft report position. Maybe 10% or less of them. Just used that URL to get the ADS-B for Dummies PDF. URL in article still seems to be broken. HTH and thanks for the interesting articles. Great article! I’ve just started playing with one of these dongles on the Mac. Do you have any information about tuning via the TCP port? Allegedly rtl_tcp supports adjusting frequency and gain by sending data to it. It does, although it doesn’t seem to be very well documented. You need to send data in binary format. To set the frequency, you send command0x01 followed by 4 bytes (of a 32 bit integer) for the frequency in Hz. Sample rate is command 0x02. Thanks Chris, perfect! I’ve also found this code sample: https://gist.github.com/simeonmiteff/3792676 which lists a couple of other commands. On to trying to figure out how to use the data! Chris, mode C transmits the barometric altitude of the plane, not mode B. 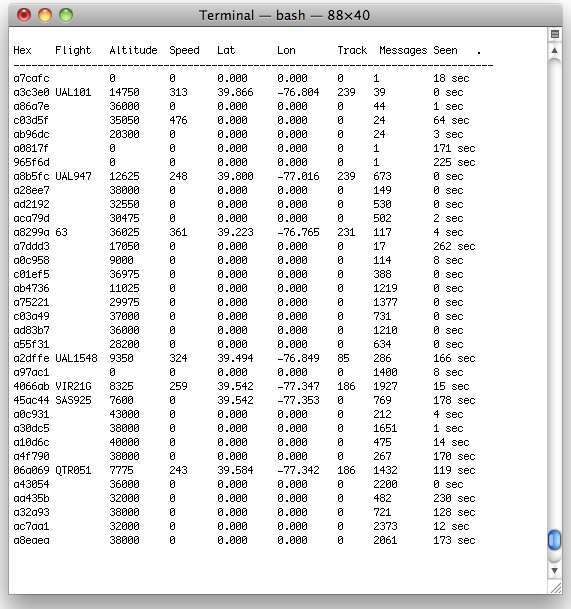 Where did you grab the icao.txt from /How did you decode the ICAO hex ? Where do you lookup the ICAO code? I know sites like airframes.org but they do not allow “bot” requests.